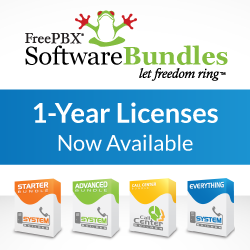 June 16, 2014 FreePBX has released updates that fix several vulnerabilities in Asterisk®. Users of the FreePBX Distro can use the provided update scripts or SysAdmin Pro module to update their existing systems. The updates released today are for the latest supported versions of Asterisk found in the following FreePBX Distro Tracks 5.211.65-13 (STABLE) and 6.12.65.-11 (ALPHA) . Users can follow the instructions found on our wiki to keep their systems up to date. Updates can be ran via CLI, or directly from the PBX Administration GUI for users of our SysAdmin Pro Commercial Module. ASTERISK® and DIGIUM® are registered trademark of Digium, Inc.
FreePBX® is a registered trademark of Schmooze Com Inc.